“Jon Jory is best known as the artistic director who brought renown to the Humana Festival and the Actor’s Theatre of Louisville — and widely believed to have penned Keely and Du, Flaming Guns of the Purple Sage, and Anton in Show Business under the penname of Jane Martin. When it comes to adapting Jane Austen, whose Pride and Prejudice is currently on view at Pease Auditorium in a CPCC Theatre production, Jory is no dilettante. He has also adapted Sense and Sensibility and Emma. All of the wit and romance of Jane Austen’s classic 1813 novel come to life in this refreshingly fast-paced and engaging new adaptation by Jon Jory. When the independent-minded Elizabeth meets the handsome but enigmatic Mr. Darcy, she is determined not to let her feelings triumph over her own good sense — but the truth turns out to be slipperier than it seems. In a society where subtle snubs and deceit proliferate, is it possible for Elizabeth and Darcy to look beyond his pride and her prejudice, and to make the best match of all? P & P will be presented in Pease Auditorium. Tickets are $18.00 for individuals. $5.00 for students with valid ID. Get your tickets at the door, at the SunTrust Box office at 704-3306534 or online at CPCCTix. CPCC Theatre is happy to announce the cast of Jane Austen’s Pride & Prejudice by Jon Jory. Pride & Prejudice runs October 28 – Nov. 6 in Pease Auditorium. 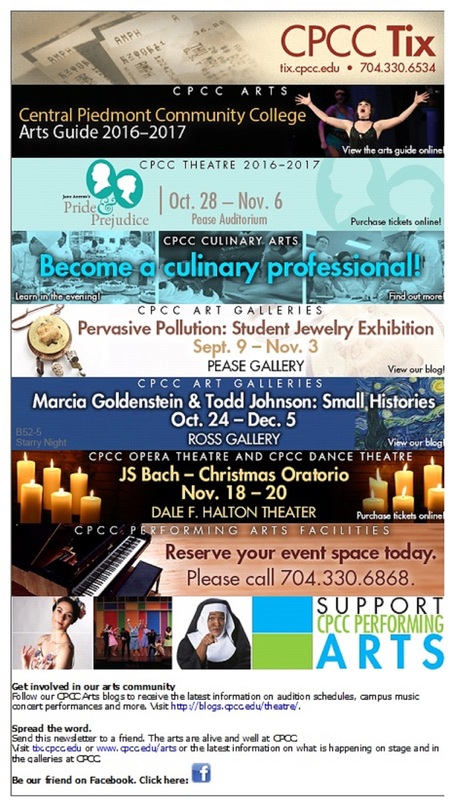 Tickets are available at the SunTrust box office 704-330-6534 or online 24/7 at CPCC Tix. Season Tickets on sale through October 2nd. 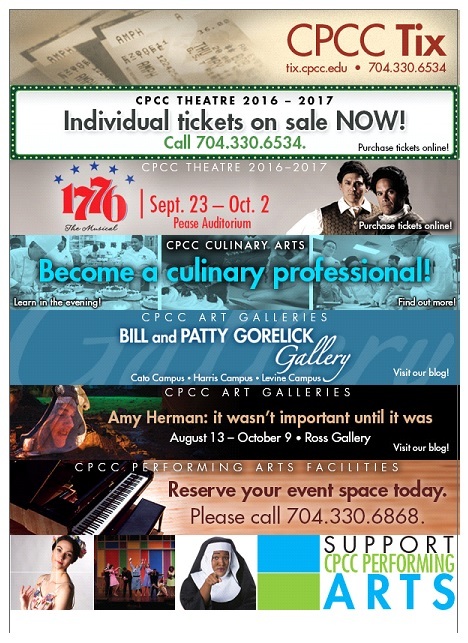 Join CPCC Theatre for another exciting season of the best in theatre at a price the entire family can afford. It’s the summer of 1776, and the nation is ready to declare independence, if only our founding fathers can agree to do it! “1776” follows John Adams of Massachusetts, Benjamin Franklin of Pennsylvania, and Richard Henry Lee and Thomas Jefferson of Virginia as they attempt to convince the members of the second Continental Congress to vote for independence from the shackles of the British monarchy by signing the Declaration of Independence. Join us for this funny, insightful and compelling drama, which features a striking score and legendary book. Watch as all the wit and romance of Jane Austen’s classic 1813 novel comes to life in this refreshingly fast-paced and engaging new adaptation by Jon Jory. When the independent-minded Elizabeth meets the handsome but enigmatic Mr. Darcy, she is determined not to let her feelings triumph over her own good sense. But the truth turns out to be slipperier than it seems. In a society where subtle snubs and deceit proliferate, is it possible for Elizabeth and Darcy to look beyond his pride and her prejudice to make the best match of all? The Tony Award winning musical “Ragtime” presents a sweeping portrait of early 20th century America, telling the story of three families in pursuit of the American Dream. At the dawn of a new century, everything is changing, and anything is possible. Set in the volatile melting pot of turn-of-the-century New York, three distinctly American individuals – a stifled upper-class wife, a determined Jewish immigrant and a daring young Harlem musician – are woven together to show how they are united by their courage, compassion and belief in the promise of the future. Based on the novel by E.L. Doctrow. It’s 1927 in a rundown studio in Chicago. Ma Rainey, the Mother of the Blues, is recording new sides of old favorites. During a tense recording session in Chicago’s South Side, August Wilson’s “Ma Rainey’s Black Bottom” exposes the exploitation of African-American musicians in the white-dominated commercial music industry. “Ma Rainey’s Black Bottom,” the winner of the 1985 Tony Award for Best Play, depicts the psychological consequences of African-American musicians’ struggles for economic an artistic self-determination in the face of racism and a shifting marketplace. Season tickets are now on sale to all performances. Season tickets are $56 for adults and $52 for seniors (restrictions apply). Individual tickets will go on sale September 1. Tickets are $20 for musicals in Pease and $18 for non-musicals. $18/20 in Halton. College and high school students who present a valid student I.D. may purchase a $5 ticket. For more information, ticket prices or to reserve your seat(s), please call CPCC’s SunTrust Box Office at 704.330.6534 or visit tix.cpcc.edu.